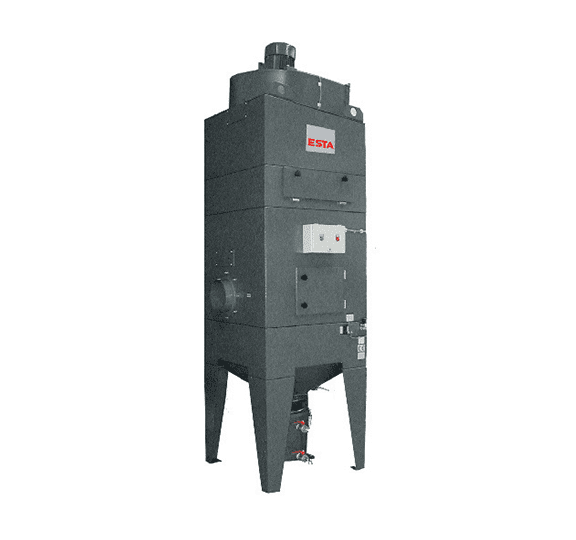 Wet separators of the NA-K series are used in applications with strong sparks or for the extraction of moist or sticky dusts. In a wet separator, air inside the unit is swirled with water. The sparks are extinguished and the air is cleaned of sticky and moist dusts. The dust bound in the water sinks as sludge into the bucket at the bottom and can be drained if necessary. The sludge can be flushed out via a drain tap without having to replace the entire quantity of water. Up to now, wet separators used for extracting aluminium dust have only been subject to individual on-site inspections by the TÜV or the BG, which were charged to the operator. With the new wet separators NA-K VA and NA-K B, all this additional work is no longer necessary. The wet separators have a TÜV type examination. Both models are additionally equipped with a forced ventilation system. Single and multi-station extraction with sticky and moist dusts, especially metallic dusts. Especially recommended for metallic grinding applications. water connection G 3/4" G 3/4" G 3/4"